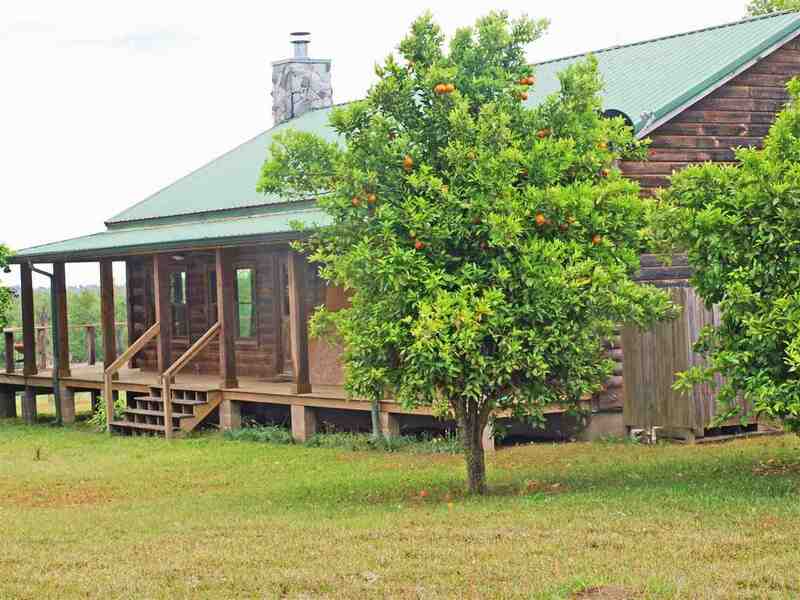 N FL MINI-RANCH WITH LOG CABIN HOME. This turnkey 41 acre working ranch features a hilltop log home with idyllic front porch views of the 37 acres of fenced pasture. Part of the 2400 sq. ft. barn is a spacious 800 sq. ft. bunkhouse (1 BR, 1 bath) to supplement the 1340 sq. ft of living space in the 2 bedroom, 2 bath log home. The high-end log home features lots of upgrades and custom features like a stone fire place, solid maple custom wood cabinets, Silestone counter tops, vaulted ceiling with rustic solid wood beams, and hardwood flooring. There's plenty of built-in interior storage space. The 2-car carport also has generous storage. Three sides of the home are wrapped by porch and decks with tranquil views of rolling pastures and fields. The setting is private but convenient. The hilltop home is one-half mile off the highway just 3 minutes northeast of the charming small town of Monticello and about 35 minutes east of Tallahassee. The D-log home was built in 2004. It has a long-life metal roof and a new air conditioner. A 600 sq. foot pavilion between the home and the barn is ideal for outdoor gatherings and entertaining. There's also a pole shed for sheltering equipment or hay adjacent to the barn. The pastures are cross fenced for rotational grazing, and there's an excellent set of working pens. This very efficient mini-ranch setup was thoughtfully planned and built by a retired Ag teacher.